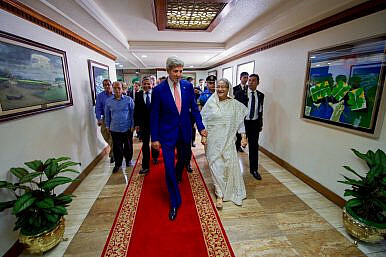 U.S. Secretary of State John Kerry walks with Bangladeshi Prime Minister Sheikh Hasina Wazed at the Prime Minister's Office in Dhaka, Bangladesh, following a bilateral meeting on August 29, 2016. At a time when Bangladesh is still reeling from the worst terrorist attack in its history, U.S. Secretary of State John Kerry’s visit carries considerable weight. On Monday, on his way to India, Kerry stopped in Dhaka and met with top Bangladeshi officials, civil society leaders, and youth, sending one unequivocal message: The United States will closely work with Bangladesh to combat terrorism. Although in the past the United States reiterated its willingness to cooperate with Bangladesh on this front, little progress has been made — largely due to Dhaka’s indecisiveness regarding how to respond to Washington’s offer of assistance. Kerry’s visit is thus likely to dispel any skepticism on both sides and pave the way for an enhanced Bangladesh-U.S. security partnership. For past three years, Bangladesh has increasingly experienced brazen attacks on an eclectic group of people, including foreigners working in Bangladesh, religious minorities, and writers who were perceived to be critical of Islam. The government of Sheikh Hasina branded those killings as the heinous work of opposition parties aiming to unsettle her government and instill fear among the public. Initially, this narrative gained some traction as the Bangladesh Nationalist Party (BNP) and its principal ally the Jamaat-e-Islami Party, which was stripped of its credentials to compete in elections prior to the national election in 2014, were resorting to street protests to make the government accede to their demands for a nonpartisan interim administration to oversee the electoral process. Thanks to its supermajority in the parliament, Hasina’s government had abolished the arrangement of a caretaker government. As a result, the BNP-led opposition alliance, along with a few others, boycotted the election, rendering it a one-sided affair. In hope of a fresh election, the opposition hit the streets, resulting in one of the most violent periods in Bangladeshi politics. Dozens of people were killed. The government quelled the wave of street violence with force. But the attacks on liberal thinkers continued unabated. So did the mudslinging between the government and the opposition. In the meantime, al-Qaeda launched its operation in the Indian subcontinent and the Islamic State (ISIS) came into prominence due to its extreme brutality. Soon both al-Qaeda affiliates and ISIS started to claim responsibility for terrorist attacks in Bangladesh. The authorities, however, remained unconvinced and laid the blame on home-grown terrorist groups abetted by those in opposition to the government. This dynamic was completely changed after a group of five young men stormed a restaurant in Dhaka’s upscale Gulshan area and brutally slaughtered 22 people, including 18 foreigners. Once again, ISIS was said to be behind this horrible attack, which shook the country to its foundation. The government was taken to task for taking the growing terrorism problem lightly. Kerry sent his deputy to Dhaka to gauge the problem in Bangladesh and discover potential areas for cooperation. Yet it did not go much further. One reason could be disagreement between Washington and Dhaka about who is to blame for terrorism in Bangladesh. While the United States maintained that it believed international terrorist organizations were orchestrating attacks inside Bangladesh, questions arose as to whether the Bangladeshi government was simply burying its head in the sand, given strong evidence of ISIS and al-Qaeda-inspired attacks. The Hasina administration continued to say that the culprits behind the attacks were indigenous terror groups. In Dhaka, he said that “there was no argument” that Iraq and Syria-based extremists are in touch with their affiliates in Bangladesh. He also said that Bangladeshi officials, including the prime minister herself, acknowledged it. This extraordinary development might well be considered the highlight of Kerry’s trip to Dhaka, simply because the Hasina administration was previously averse to accepting the suggestions of links between global terrorist groups and terror attacks in Bangladesh. Kerry’s trip to Dhaka, although brief, was carefully crafted to bring the bilateral relationship to the next level. Arriving in Dhaka, Kerry went to visit the residence of the country’s founding father, a first for a U.S. foreign secretary. In a speech to the youth and civil society at the Edward Kennedy Center in Dhaka, Kerry recalled Bangladesh’s struggle for independence and his personal support for it, even though the U.S. administration at the time was not in favor of Bangladesh’s independence. These gestures may seem inconsequential, but in the Bangladeshi context, they proved to be a game changer. Local reports suggest that Kerry’s personal touch was well received by the government of the Awami League Party, which takes tremendous pride in leading Bangladesh’s liberation movement. Kerry also complimented Prime Minister Sheikh Hasina’s leadership and commended Bangladesh’s success story. In the aftermath of the controversial election in 2014, Sheikh Hasina’s government faced a legitimacy crisis in the international community, which continued to call for a fresh election. Therefore, Kerry’s trip signals that the United States is ready to work with the current administration regardless of its stained democratic credentials. John Kerry’s visit demonstrates that the United States does not want to see Bangladesh fall under the grip of terrorists. As a result, Washington is placing a premium on strengthening working relations with Dhaka. However, whether or not Bangladesh can reap the benefit from this partnership largely hinges on the country’s political stability, democratic environment, and institutional capabilities. It is true that Bangladesh’s fragile democratic system and deteriorating human rights situations did not dominate Kerry’s agenda. But his meeting with the BNP leader and former Prime Minister Khaleda Zia indicates that Washington considers the BNP to be a legitimate political force despite the government’s claim to the contrary. Furthermore, Kerry said the United States is willing to assist with Bangladesh’s overall democratic transition. Aside from bolstering its partnership with Bangladesh, Washington should continue encouraging Dhaka to create a broad political consensus on battling terrorism. Kerry had it right when he said that the Gulshan attack was “designed to divide Bangladesh.” Dhaka should make sure that there is no room for political and societal cleavages that can be exploited by the terrorist groups. Terrorism poses threats to the entire country, not only to a particular person or a particular party. Hence, a united nation is imperative for Bangladesh’s fight against terrorism. And who else would know the importance of being united better than the United States? The United States should stress that the government in Dhaka must work in concert with other political parties, the private sector, and civil society to launch a concerted campaign against terrorism. A year after the Dhaka bakery bloodbath, counterterrorism remains deeply political.